One of Lisbon’s hallmarks are the “eléctricos,” the yellow trams that have helped residents negotiate the city’s narrow streets and steep hills since 1901. 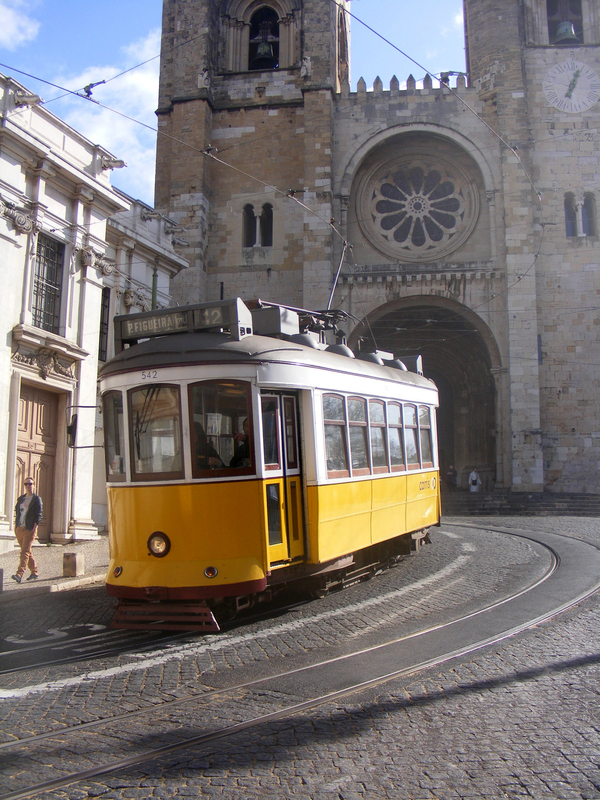 A very popular way to see Lisbon is to board tram number 28. You can make Campo de Ourique your first stop and have a wonderful lunch at Tasca da Esquina. Save some room for dessert because, around the corner, you can eat a slice of life-changing chocolate cake. Don’t drink coffee yet; the tram takes you to Chiado where you can have an espresso at Brasileira, one of poet Fernando Pessoa’s favorite cafés. Next, the 28 goes downtown. You can stroll in Rossio and sit in the esplanade of Café Nicola, enjoying the views and drinking another cup of coffee. Then, walk to Terreiro do Paço through Rua do Ouro (goldsmith street) or Rua da Prata (silversmith street). In Terreiro do Paço you can contemplate the Tagus river and have yet another coffee at Martinho da Arcada, another Fernando Pessoa favorite. Now that you are fully caffeinated, board the 28 to go uphill to Alfama, the only neighborhood that survived the 1755 earthquake. You can walk to St. Jorge’s castle and enjoy the sunset views. Then, back to Chiado, where you can have a great dinner at Cantinho do Avilez, followed by some ice cream at Santini. As the day ends, you’ll realize that the tram 28 is much more fun than the Orient Express. I am afraid you left out the newly aclaimed “best pastel de nata” of Lisbon at Pastelaria Aloma in Campo de Ourique (just a block from “O Melhor Bolo de Chocolate do Mundo”. Yes, Campo de Ourique is the place! Dear Ms. AA: we agree that this omission is regrettable. We hope to be able to visit the Pastelaria Aloma soon!